Sphalerite is not a very well-known gemstone, but it is certainly an intriguing one. Sphalerite gems are usually a bright, fiery orange. Faceted the right way, they can be dazzling to behold. Interestingly enough, in its raw form, sphalerite is usually grayish in color, but may also be that deep, brilliant reddish orange. 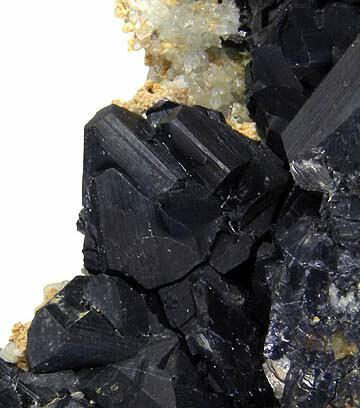 Nicknames for the gemstone include black-jack, ruby jack, and zinc blende. The name “sphalerite” comes from the Greek “sphaleros,” which translates to “deceptive.” The reason this name was chosen is because sphalerite is easy to mix up with galena. Galena is an important source of lead and silver. On a chemical level, sphalerite is the chief ore of zinc. It has an extremely simple chemical formula: (Zn,Fe)S. As you can see, zinc sulfide is the principal constituent, but iron is usually present as well. The degree of iron determines the appearance of the stone. 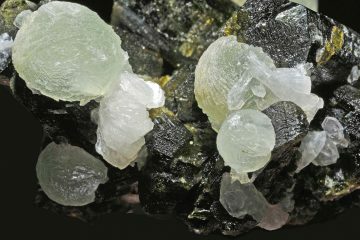 Sphalerite gemstones have been found in mines around the world, including in Germany, Switzerland, Eastern Europe, Russia, Peru, and the United States. Why is sphalerite sometimes a gray or black color, and other times orange or red? It all depends on how much iron is present! When there is a great deal of iron present in a specimen of sphalerite (as is common), the stone will generally be gray or black and may even be completely opaque. When sphalerite presents in this fashion, it is sometimes known as “marmatite.” Other times, when there is less iron present, you may get the transparent orangey variety. Sphalerite is often discovered by miners together with other sulfides or with pyrite or galena. It is not only the color of sphalerite which varies, but other aspects of the appearance as well. 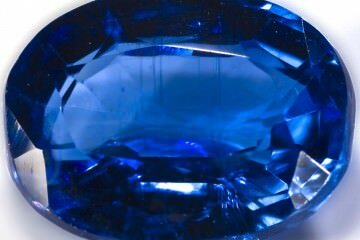 The gemstone may be dull or it may have a shiny surface. Yellow or light brown streaking may be present. The transparent reddish or yellowish stones contain very little iron. On the Mohs scale of hardness, sphalerite rates a 3.5-4, so it is quite easily breakable. Specimens have been known to sometimes fluoresce under UV light. Sphalerite has no particular use in industry, but the gemstones themselves are sometimes collected. In order for a piece to be considered gem quality, it must usually be translucent or transparent with an orange, red, yellow, honey brown, or green color. Occasionally, opaque pieces may also be collected if they showcase a unique and beautiful crystal formation. Note that a single piece of sphalerite may showcase more than one color. Sphalerite jewelry does exist, but as you may have guessed, it is not all that common owing to the fact that sphalerite is quite soft. Setting it without breaking it can be a challenge in itself, and it must be worn and stored with great care. For that reason, it is common for gemstone aficionados to collect sphalerite without having it set. It may either be cut and displayed or it may be showcased in its unique, raw form. 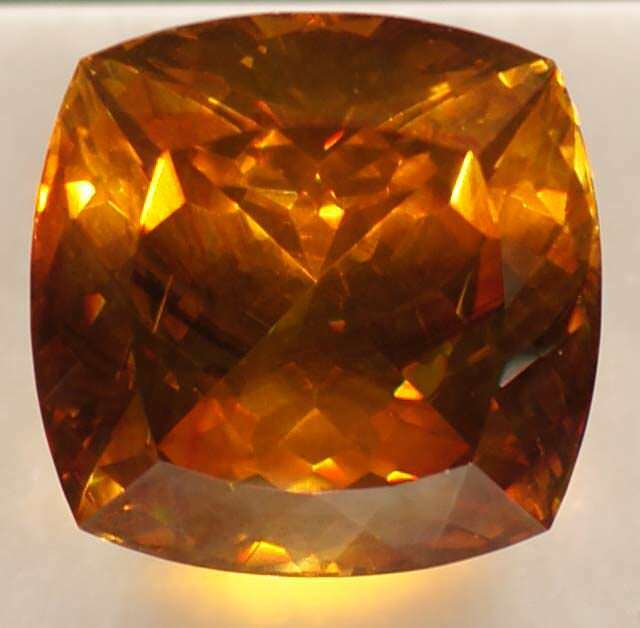 When purchasing sphalerite, the main factor which will impact the value will be the color of the stone. The level of transparency may also affect the value (the more transparent and flawless the stone is, the better. However, some inclusions are to be expected; very few pieces are actually flaw-free). The cut and the setting may also raise the cost. Oftentimes however, sphalerite is sold in its raw form. As you can see, sphalerite gemstones are prized based on their rarity, not simply the aesthetic association with a certain hue. The most valuable form is the bright fiery orange, but this is followed quite closely by the most strongly green hue. The least valuable stone is the dark brownish variety. Shades of yellow are prized less than the green or orange, but are still considered quite valuable. 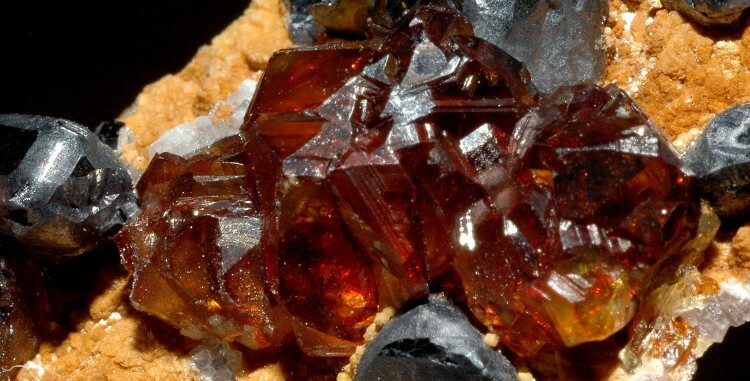 Despite its delicacy, sphalerite is sometimes crafted into jewelry. Its beauty can be breathtaking, especially when pieces showcase more than one hue. 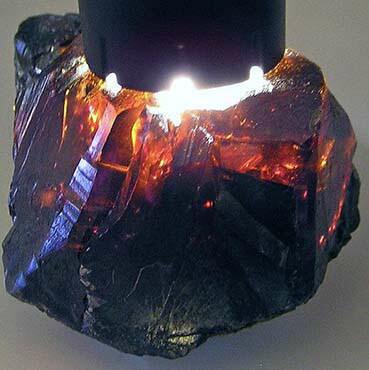 It is most common for sphalerite to be made into pendants and rings. Earrings are less common, probably because it is challenging to cut the sphalerite into small enough gems without risking a fracture. Sphalerite may be set in any metal, but typically seems to be set in sterling silver. 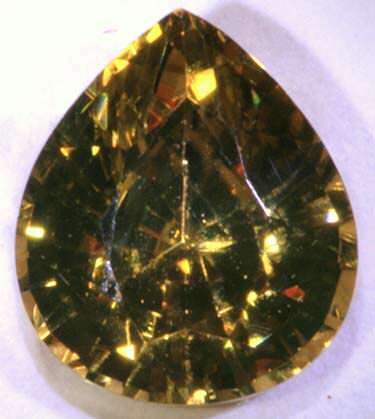 Sphalerite is rarely tumbled; it is usually used in its raw form or faceted. As you may have already guessed, sphalerite can be expensive. A sphalerite ring will typically run you more than $100. Depending on the quality of the gemstone and the craftsmanship of the piece, you could even pay thousands of dollars. Sphalerite is rarely used for engagement rings. The reason is that even though this is a very beautiful stone which can be spectacular to behold, it is also quite delicate. 3.5-4 is not very hard, and it is far too easy for the gemstone to shatter. As an engagement ring is going to be worn day in and day out, you want to choose a stone for that which is going to hold up to daily wear. This is of course one of the reasons why diamond has become the gemstone of choice. 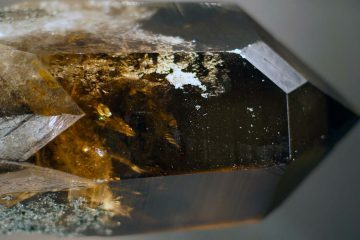 Sphalerite is a spectacularly beautiful and unique-looking gem. Its appearance can be breathtaking; the pieces which are reddish orange with warmer shades of orange or gold in their centers look almost as if they contain fire inside. This is a mesmerizing visual effect unlike any you will see elsewhere. Faceting does a spectacular job at bringing out this effect. Because sphalerite comes in a range of different hues, there is something for everyone. Sphalerite’s rarity makes it a fascinating choice for collectors. It can make for an excellent conversation piece. The softness of this gemstone makes it easy to scratch or break. For that reason, it must be treated with extra delicacy, and may not be suitable for everyday wear. Because sphalerite is not a very well-known gemstone, it may not be something that every recipient will be happy with. Many people like to receive gemstones which are more familiar, like diamond, topaz, or sapphire. Not everyone can appreciate a rare gem, since it does not make for a traditional gift. If you ever need to have sphalerite jewelry reset for any reason, it could pose difficulties. Remember, setting sphalerite at all is a delicate task, which is why many sphalerite gems are never set. It is far too easy for the stone to break. For that reason, you are taking a risk every time you do it. Cleaning Sphalerite: Because this is such a soft gemstone, you must take great care when you clean it. In fact, even wiping dust off the surface of the stone can cause scratches to form because dust is harder than sphalerite! This is why you should begin by rinsing the stone in soapy water. Once the dust is removed, you can wipe it gently with a soft cloth. Rinse thoroughly so that no soapy residue remains on the gem, and then either gently mop it dry, or leave it air dry. Never use ultrasonic or steam cleaners on this soft gemstone. Storing Sphalerite: Keep sphalerite in a cool, dark place. Most importantly, wrap it up or put it in a soft pouch or a separate jewelry box with a softly-lined interior. That way it will not come into contact with other jewelry items which could scratch it while it is being stored. Wearing Sphalerite: Be careful when you are wearing sphalerite. Take it off before you do any physical activities, and make sure you are not wearing it when you are applying cosmetic products which contain chemicals. These products may damage the gemstone. Note that sphalerite may be better for pendants than for rings, since the stone will be subjected to less wear and tear. 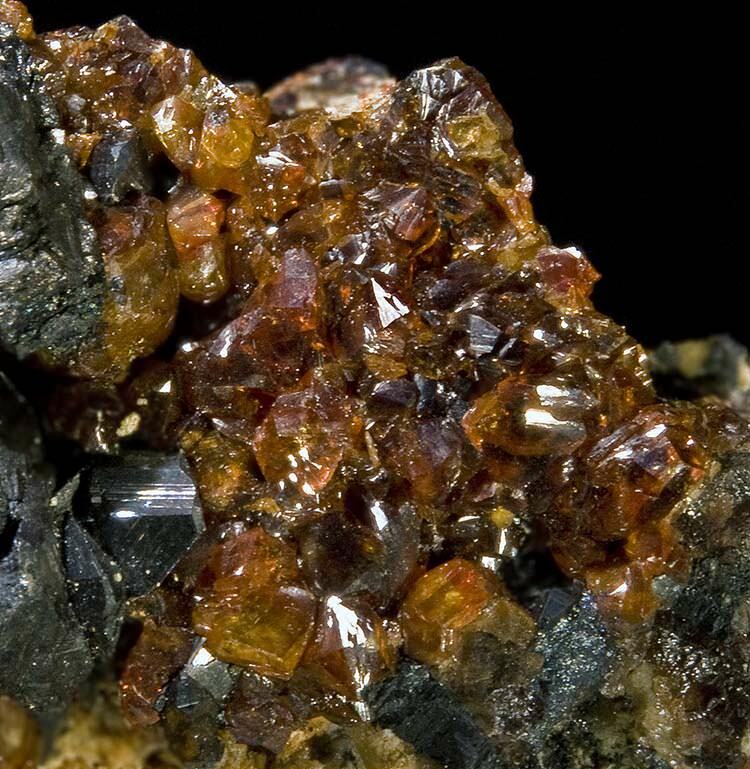 Sphalerite didn’t appear to yield any useful metal, but it looks and feels like metallic ore. Because of this, Agricola said it “blendet und betrugt” him—“blinded and deceived” him. Agricola didn’t realize that sphalerite actually does contain zinc, which incidentally is a metal. It’s hard to say why this incorrect meaning was preserved, but then again, perhaps it could still be argued that the stone was deceptive. It wasn’t deceptive in the sense that Agricola believed, but Agricola was deceived. He was deceived into thinking the stone didn’t contain metal! 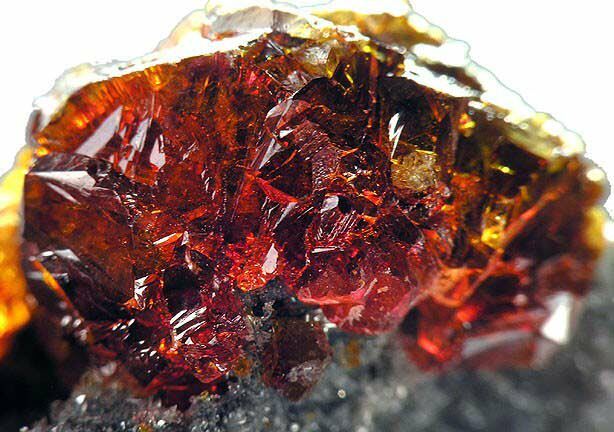 While many relatively obscure stones play a popular role in metaphysical lore, sphalerite isn’t one of them. Not a lot of meanings are associated with this gemstone. Because of its colors, though, it may be linked to the root, sacral, and solar plexus chakras. This would make it a great stone for grounding and centering and for balancing out higher energies. It can reconnect you to your environment and enhance your physical awareness. It may also help to hone qualities of leadership. It may be a good stone to help you to manifest your will. A massive 342.54 ct red-orange sphalerite showcasing the stunning fire of this gemstone. 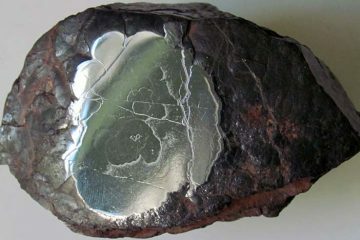 Galena: This is a crystallized mineral containing lead. It looks similar to pyrite, except it has a distinctly gray hue as opposed to a golden one. It is regularly confused with sphalerite, but can be distinguished in a couple of ways. For one, it is heavier. For another, the gray is on the cooler end of the spectrum, and may even appear bluish in a certain light. This is not the case for sphalerite, which features warmer tones. Pyrite: This common metallic crystallized mineral is known as “fool’s gold” because its golden sparkle can readily deceive the eager eye. Aside from its color, it looks very similar to galena. It is less likely to be mixed up with sphalerite, but it is still possible. Topaz: Topaz is a popular gemstone which is available in a wide range of hues. Champagne-colored topaz gems are particularly well-known however, and easy to mix up with the honey brown specimens of sphalerite. Topaz is quite a bit harder than sphalerite, however, rating an 8 on the Mohs scale. This ultimately makes it quite easy to distinguish. It also tends to be much freer of inclusions than sphalerite. Diamond: Diamonds may come in a similar champagne hue as well—and may occasionally even be red, though red diamonds are incredibly rare and expensive. So this is yet another gemstone that may occasionally be confused with sphalerite. Diamond however is much harder (10 on the Mohs scale of hardness), and may actually be relatively flawless. Sphalerite almost always is going to have significant inclusions. Zircon: This is a common form of imitation diamond. Just as it can easily be mixed up with diamond, it can also be confused with sphalerite. Idocrase: While it is not very common, sphalerite may sometimes occur in an olive green color. When it does, it looks very similar to a gemstone called idocrase. Idocrase may also form with a number of inclusions, so this makes it even harder to tell the two apart. On the Mohs scale of hardness however, idocrase ranks a 6.5. This difference in hardness may assist with identification. Chrysoberyl: This gemstone is another tricky one to tell apart from sphalerite. Chrysoberyl may range in hue between olive green and honey brown. Being as sphalerite may come in either of these colors, this makes identification extra-challenging. Thankfully there is one major difference, and that is hardness. Chrysoberyl rates an 8.5, which makes it a great deal harder than sphalerite. It is even harder than topaz! Cassiterite: Just as sphalerite is the main ore of zinc, cassiterite is the main ore of tin. Like sphalerite, it can occur in a black, opaque form, or it may be yellow, brown, orange, or red. When it occurs in one of these hues, it may also be transparent. It may then be fashioned into a faceted gem. In terms of hardness, cassiterite ranks in at 6.5. 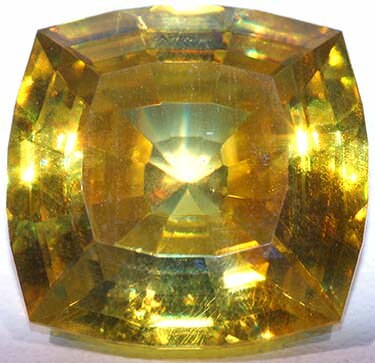 Sinhalite: This rare mineral is a deep, brownish yellow color, and may be faceted into a clear gemstone. It may be confused with the honey brown form of sphalerite. Its hardness is 6.5. Sphalerite may not be the most famous gemstone around, but it can be a dazzling one to display in your collection or to wear or gift to someone special. No matter what form sphalerite comes in—whether it is raw, opaque and metallic in appearance or transparent, faceted and fiery—it is sure to make for a fascinating conversation piece. Yes, unfortunately sphalerite is simply not very suitable for jewelry and is mostly just sold to collectors or museums. If you are careful with it you can wear it in a pendant, however if you have already had some accidents before, like you said, we think you’ll be better off buying another gemstone.